To me, personally, India came alive via a different kind of geography class this Blogging Marathon. The North Eastern (NE) States of India (aka the 7 sisters) posed such a googly to us marathoners that we were constantly in a state of confusion, clarifications and even recipe sharing when it came to authentic recipes from these Northern States. 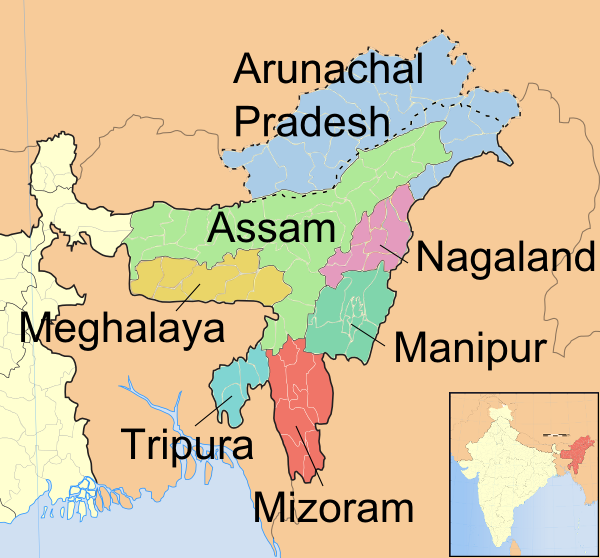 Assam, Arunachal Pradesh, Tripura, Miozram, Meghalaya, Manipur & Nagaland comprise the 7 sisters. Never in the history of BM, have we all been so frenetic in planning for the dishes ! What seemed to belong to one NE State also seem to be made in another. Vegetarian dishes were rare to source out, and what seemed ok had either unviable ingredients or strange sounding masalas. Amongst these NE states, we were so desperate at one point that we decided that whoever makes one veg recipe should simply share and others would make the same. In the end, I guess it all went well, and each of us present these NE states from our own kitchens with our little own substitutes or personal interpretations. However, it must be said that most of the main course consists of beef and pork and dried fish, and is consumed with very little oil and in a semi broth form. Some chutneys and pickle forms do exist, but we definitely need to have an evolved palate to appreciate this cuisine. Today’s recipe is a Vegetarian Thukpa (pronounced as 'Thuppa' with a silent K), and is essentially a broth with veggies and noodles. Its predominantly made with Chicken, but as I said, we have made our slight modifications with NE recipes to suit our palate and vegetarianise or veganise them. The ethnic cuisine of Arunachal Pradesh with great nutrients value is simple to cook and scrumptious to consume. The incredible feature of tribal gastronomy is that they avoid using any kind of oil or other dry or packed Indian spices. Rice is the staple food of all the tribe’s of Arunachal Pradesh. Dung Po (Steam Rice) is the most popular version of cooking rice. Kholam is also another popular and unique process of cooking rice. In this method a bamboo tube is used instead of metal utensils. The rice is filled with water in a custom made bamboo tube measuring 21/2 feet in height than it is left beside the traditional heath with enough heat to cook it. Before eating the rice the outer layer of the bamboo tube is delicately incised. Coming back to today’s recipe, It’s a quick to make, hearty broth – which is sipped as a soup / appetizer or even had as a main course. Lets get to the recipe. Add chicken if you planning to make this non-vegetarian. Tofu is also added, but as I have no takers for that at home, I simply went ahead with the available ingredients. Boil the noodles as per packet instructions. Drain and reserve. In a large pan, heat oil, and sauté the veggies. Add the vegetable stock, salt and green chillies and bring to a simmer. Once the veggies are ¾ done, add the boiled noodles and turn off the stove. If too bland, recommend adding a dash of soya sauce or sweet chilli sauce to liven up. Any veggies can be added – it’s totally a personal choice. Omg, thupka looks very delicious, i can make a bowl of this soup rite now and enjoy for my lunch. Super write up and a amazing soup . Even though I am not a soup person I liked it when I made and my son simply freaked out on this one. So many thukpa recipes today but each one is unique and wondering so many versions. The soup looks great. Nice presentation. Good one..As we all know Thupka wins hands down!! Can I order some Mom Chef! The thupka is so delicious and the bowls are awesome. my son wants this simple noodle preparation over our sambar, rice and poriyal. Easy for me as well :D. The thupka looks good, will be trying out one by one all the recipes. Though it was a thukpa day in BM, we all came up with different versions of thukpa. Love your version too.